Transform your garden without the expensive professional overhaul! 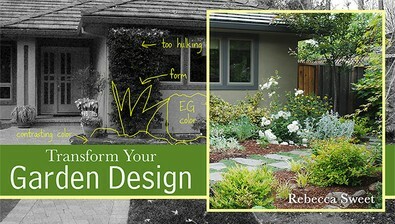 Join landscape designer and author Rebecca Sweet as she shares essential techniques for reviving your garden design. First, Rebecca will teach you how to begin your garden transformation by editing your garden and breaking down key elements using photos. Then, find out how to create echoes in your space to add a sense of continuity using color, texture and form. Begin with the simplest element, color, before exploring the unexpected and touchable textures that the plant world has to offer. Finally, learn about shape and form and how to incorporate this subtle element into your garden design. By the end of this class, you will have identified gardening mistakes and learned how to correct them with easy-to-understand and easy-to-implement solutions.